Rugby Town visit Brackley on Saturday looking to secure a place in the FA Cup Fourth (and final) Qualifying Round for the first time since 1994. Their opponents currently play two levels above Valley in the renamed National League North, although the Northamptonshire side have had a sluggish start to their league season – sitting just one place of the bottom of the table. The weekend tie represents a fourth Third Qualifying Round appearance for Rugby over the last decade, with away defeats at Bishop’s Stortford (2006) and Worcester (2013) and a home loss to Chelmsford (2008) halting their progress from it previously. Town go into the game having departed two other knock-out competitions over the past week though, after a 4-2 F.A.Trophy reverse at St.Ives last Sunday and a penalty shoot-out exit against Walsall in the Birmingham Senior Cup at Butlin Road on Tuesday evening. Last Wednesday’s comfortable 3-1 league success at Carlton did at least lift Dale Belford’s men off the bottom of the NPL South Division table, as the recently arrived manager looks to push his new side up the table. Belford reflected on his first couple of weeks in charge: “I think that anyone that has watched us recently will agree that there are plenty of positive signs. The lads are working hard for each other and there is a good togetherness and spirit evident. Looking ahead to the cup fixture, Belford continued: “I still firmly believe that the FA Cup is the greatest cup competition in the world, and we already have done fantastically well to get to this stage. Belford has continued to strengthen the squad he described as “threadbare” on his arrival. Ex-Coventry City and Northampton midfielder Kevin Thornton signed ahead of last week’s win at Carlton, whilst he also secured keeper Raaj Gill on a dual registration basis from his old club Tamworth. Striker Danny Reynolds and midfielder Iwan Cartwright also joined on a month’s loan from National League Wrexham, with Belford hoping to add another midfielder to the squad ahead of the trip to Brackley. He said: “There was an immediate need to boost numbers, but now we are trying to build real strength in depth. Kevin has done exceptionally well in his first three games here and is indicative of the type of player we are trying to bring to the club. Unfortunately Thornton is cup-tied for the weekend, but Gill, Reynolds and Cartwright have all been given permission to play by their parent clubs. Belford will assess the fitness of injured defensive trio Tom Ryan, Ryan Walker and Craig Kelly at training on Thursday, as he seeks to register a first ever victory in nine attempts against the Saints. Unless a cup replay is required that evening, Town return to league action on Tuesday when Kidsgrove are the visitors to Butlin Road. 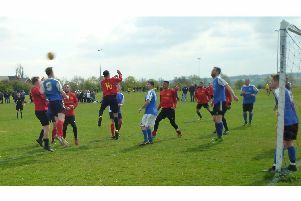 The Staffordshire club are currently tenth in the table, seven points ahead of Rugby. Valley are then scheduled to face successive weekend away trips to league leaders Stafford (17th October) and fifth placed Sheffield (24th October). # The coach to Brackley will leave the clubhouse at 12.15 p.m. For latest information on this, contact Tony Mann on 07970 691366.